Delivering to More Destinations Next-Day Than Any Other Carrier. 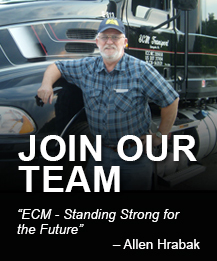 ECM Transport works closely with PITT OHIO to deliver Less-Than-Truckload shipments. PITT OHIO takes great pride in delivering quality Less-Than-Truckload (LTL) service that is the best in the industry. For over thirty years, PITT OHIO has been a leader in the LTL industry delivering to more destinations next-day than any other carrier. Your shipments arrive when you need them, in good condition and from a professional and courteous driver because of our reliable 97% on-time service and an industry leading claims prevention ratio of .5%. With new safety protocol in place, it is more important than ever to partner with an experienced company. As a hazmat certified carrier with an industry leading and award-winning safety department, you can trust PITT OHIO to deliver. For a worry and hassle-free shipping experience, PITT OHIO has made it easy for you to track and trace your shipments in real time on www.pittohio.com.